Copenhagen has finally arrived in Toronto. This breathtakingly dazzling play of ideas was one of the best plays of the last decade. Now the Mirvishes have brought it to Toronto in an all-Canadian production with a cast that could not be bettered. 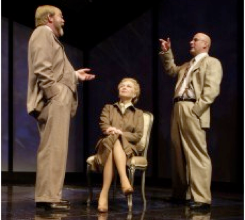 Somewhere beyond time or space, the spirits of nuclear physicists Werner Heisenberg (Jim Mezon in an outstanding performance) and Niels Bohr (a vigorous Michael Ball) and Bohr’s wife Margrethe (an incisive Martha Henry) continue to re-enact a central puzzle in their lives. Why did the German Heisenberg come to Nazi-occupied Denmark in 1941 to speak with his friend and former mentor Bohr and what did he say that caused an unbridgeable rift between them? Inspired by Heisenberg’s famous “Uncertainty Principle,” Frayn presents us with three possible answers, and in doing so uncovers a moment that may have changed the course of history and raises fundamental questions about chance, politics and the ethics of science. The one flaw is the unnecessary use of video projections that distract when you don’t want to miss a single word. The play demands close attention. The reward is a truly mind-opening experience. Note: A version of this review appeared in Eye Weekly 2004-01-15. Photo: Michael Ball, Martha Henry and Jim Mezon. ©2004.